Home > News > Sports > Where to watch London 2012 Olympics live online on PC and Mobile Device for free? All eyes are on London these days, where athletes of the world are getting ready to compete in the 2012 Olympic Games. And there’s some good news for sports fans: Not only are the main competitions scheduled to happen during times when most of us in North America are actually awake, you’ll also be able to watch almost everything in real-time online – as opposed to the hours of tape delay that are common for traditional TV coverage of the games. However, there’s a bit of a caveat: NBC will be streaming more footage than ever before – but only to viewers that can authenticate themselves as pay TV subscribers. How does that work, where can you watch once you’re authenticated, and what else can you do with your iPad, iPhone or Android mobile device? How to get access: To watch any of NBC’s live streams, you’ll have to first authenticate yourself as a pay TV subscriber with access to both CNBC and MSNBC. That should cover most cable and satellite customers, but you might be out of luck if you have an analog basic package that doesn’t include both of those channels. Viewers need to authenticate before they can access NBC’s live streams online. 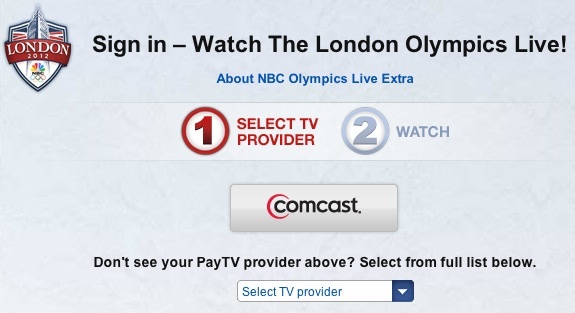 Authentication is fairly simple, and can be done even before the games start: Just go to NBCOlympics.com or launch NBC’s mobile app, start the authentication process and select your pay TV provider. You’ll then be forwarded to your TV provider’s website, where you’ll need to log in with your username and password. Don’t have those at hand, or maybe you never signed up for an online account with your cable provider before? No worries, NBC will give you a break in form of a four-hour viewing pass. This feature is rolling out on NBCOlympics.com on Saturday, 7/28. Watch on NBCOlympics.com: Once authenticated, NBC is going to stream every competition on every sport, totaling more than 3,500 hours of live coverage on its website. The streams will be available as 1080p HD, if your Internet connection can sustain it. Viewers will even be able to watch specific parts of an event. Really love the long jump, but don’t care about all the running during track and field competitions? NBC has a live stream for you. A live stream on the NBC iPad app. Watch on your iPad or iPhone: The live stream will also be available through a dedicated app for iPads, iPhones and iPod touch devices. The app does require authentication, so get your pay TV credentials ready, and then head over to iTunes. Watch on your Android device: NBC will also provide live streams through an Android app, which essentially mirrors the look and functionality of the iOS app. And of course, viewers will need to authenticate as well. However, there’s one big downside for Android users: the app will only work with a limited number of devices. How can you know if it will work for you? Just go Google Play, log in with your Google account, and check the green box under the install button on the left. The other NBC Olympics app: NBC and Adobe built a separate app to keep track of the performance of athletes in London and show highlight videos. This app doesn’t require any authentication, but can be used in concert with the live video app. And there’s a so-called Primetime Companion mode that can be used to receive additional information synced to competitions you’re watching on TV. It’s available for both iOS and Android, but the Android version doesn’t work on all handsets. Shazam: The sound-tagging app will offer check-ins, up-to-the-minute results, polls and other extra features throughout the Olympic Games. Shazam knows which competition you’re watching by listening to your TV’s audio feed, and is available for both Android and iOS. 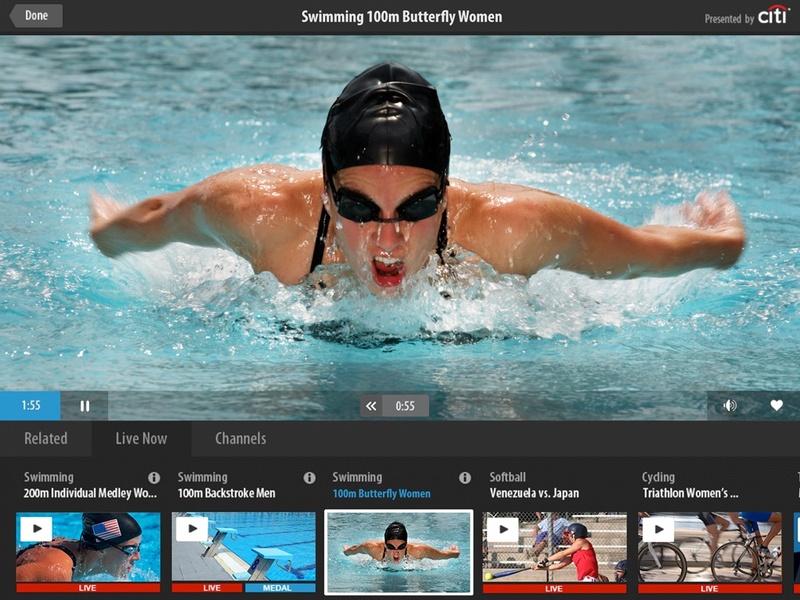 BuddyTV wants to help you find the the games on TV. BuddyTV: Online TV guide BuddyTV wants to make it easier to find the competitions you like when they air on TV, which is why the company introduced an Olympics-specific quick-lists feature to tell you exactly what’s airing where and when. 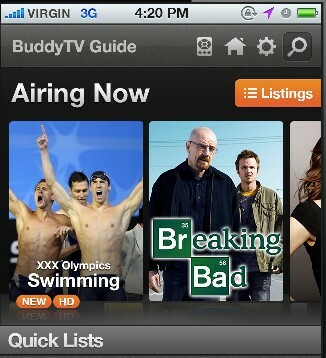 BuddyTV also comes with a bunch of social features, and is available for iOS, Android and Google TV. PlayUp: Sports fans who want to geek out while watching their favorite artists compete can use the new version of PlayUp’s sports-centric second screen app to chat live with like-minded viewers. PlayUp also ropes in relevant Twitter feeds and live results, so you won’t miss any of the action. PlayUp is available for iOS devices in the iTunes store. The NBC Olympics site offers live streaming coverage of the entire London 2012 Olympic Games online and on their mobile/tablet apps. All 32 sports and 302 events will be shown including live video feeds, highlights, event results, schedules, TV Listings, gold medal races and more. According to NBC, “Whatever is on schedule that day, if cameras are on it, we’ll stream it“. That’s the good news.